Do you need ideas for those difficult presents? Well I have two ways of helping you in this post: Ideas and a competition for a fabulous £100 hamper. (Actually I recommend keeping the hamper or giving it to me, and buying the presents!). What I’d really like to say to the men ‘who never need anything’ or ‘who have everything’ is, PLEASE STOP BUYING STUFF FROM SEPTEMBER ONWARDS, so that we have a chance of finding something to buy for you! Or there’s the ‘Oh I prefer to give at christmas, I don’t need anything in return’ thingy; yeh whatever, I know you, I know you are going to turn up with a lovely, well thought through little gift for me and I’m going to feel really guilty! But I have a solution!! Oh yes I have! (Ok relatives, please now go and read something else!). If you have a really rich relative, then blow them away by winning this fabulous hamper from Interflora worth £100 and giving it to them by leaving a comment below (see more details about competition entry at the end). Or as I suggested, keep it for yourself – you can always invite them over for Christmas dinner. There are lots more Christmas Hampers here, which go from a much more affordable £19.99. Personally I like the Christmas biscuit tin, but then I love tins or boxes of any kind as you’ll know if you’ve read my de-cluttering posts! Or the christmas cracker packed with chocolates would suit me too. For my in-laws I reckon the ‘Luxury Breakfast tray’ is gorgeous and definitely something that you know people would use. I have a little irish granny help me with looking after Little Dimples who the ‘Christmas Cracker’ at £60 would work as I know she loves champagne and she’s been a really special person, so worth it. If you have a friend, wife, sister or sister-in-law to buy for then they have a whole section called ‘gifts for her’. My favourite is the box (remember what I said about boxes/tins) with gorgeous hand cream, candle and shower gel. Or there is a box of personalised cup cakes, which look gorgeous and since my son’s party I’ve been a big fan of cupcakes. I didn’t realise that Inter-flora did anything other than flowers (of course there are flowers too, if you want to be more traditional). Lastly if you love watching Kirstie Allsopp, but are actually pretty craft-challenged or maybe just don’t have time like me then you can buy your wreaths all ready made. They are quite expensive for parents cutting costs at christmas, but the little festive outdoor barrel would look really pretty on our porch and would be a lot more tasteful than the huge box of lights that the big hairy northern one is about to get out of the loft (yep he is one of those, but I have drawn the limit at a Santa running across the roof). Right now onto the best bit of this post, Inter flora have kindly sponsored this post and offered that fabulous hamper worth £100. That’s a pretty big part of the christmas lunch bill off your expenses list, so apply now and then be kind and tell your friends to apply; so that Santa brings you a present too for being such a good Mummy (or Daddy!). The closing date is Thursday Dec 8th at midnight – any entries after then will not count – and the results will be released first thing on Friday 9th. So you have less than a week to enter, because I wanted to make sure there is time for the hamper to get to you. Are you looking after the foundations of your health, strength and vitality? Would love to win this, would share with relatives who do the Christmas day cooking, it would make boxing day pretty much sorted! yes please – we’re hosting xmas and that would be fab! I would love to win this as it would be a great addition to my Christmas! This looks gorgeous. I think it would look very nice on my kitchen table! I’m entering! I would give this Hamper to my friends as the husband has no work at the moment. I would keep it all to myself and if there are any newbury fruits I would share those with the family because they were always the worst present to receive each year. I’ll need it as I have 8 for xmas lunch! Wow, what a great hamper! I’m tempted to say I’d keep it all to myself, but actually I’d share it with my in laws. They’ve had a tough year so we could have a lovely pre-Christmas dinner with them when they come to visit. This would be our contribution to the big family party on Boxing Day, I’m sure it would help it to go with a bang! This would be perfect for our first family Christmas at home together. I’d share this with my closest friends! I’d share it with my family (apart from the choccies which I would keep for myself!). Mum spends a fortune buying Christmas food for us all every year so this hamper would be a nice way of repaying her. My dad always cooks for me and my kids, and so it would be lovely to be able to give him something to say thank you! I’d give this hamper to my Mum, if I won it – she chooses to spend Christmas alone, but she could do with a treat! Is it naughty that I would keep the hamper? pennies are tight this year, and I haven’t got any treats in yet! As much as I’d absolutely love this hamper myself for Christmas (I must make sure my hubby reads this! ), I would give it to my son. It’s his first Christmas away from home and also my first Christmas without him. He’s on his own and I know that these delicious treats would definetely bring comfort to both of us at Christmas! Brilliant giveaway. I would definitely share, with my parents and sisters – we all live a few doors from each other which is nice. I would give it to my mum and dad, they would love it! Share it with my family. I would share it with my family – my mum and dad deserve something special. Would be a lovely surprize if this arrived on my doorstep ? Wow, fantastic prize. I’d give it to my parents. I’d share it with my family so we can all have some treats together. Lovely! I’d use the hamper as a good excuse to get all the family round to enjoy it. If we won the hamper we would keep it and enjoy it as a family. We’ve had the worst year you could possibly imagine so a nice treat would be fantastic. I hope everyone has an amazing Christmas. I would love to win this as i’m a rubbish cook and I reckon it could be our alternative Chrismas Day Hamper!!! Then I can kick back and enjoy the day instead of stressing about cooking!!! What a fantastic comp.. Merry Christmas!!! I would give it to my mum and Dad. They always have us over for Christmas and it would be lovely to turn up with this hamper. It would be a real treat for them. If I won this would be perfect for my father for his xmas. He lives alone and cooks his own meals, I’m proud of him and would love this treat for him. I would say that I would send it to my mother, but seeing as everyone has managed to invite themselves round to my house, she woldn’t see it! So I’d be reluctantly ( ;0) ) forced to keep it myself to make the crowd’s Christmas extra-pretty! What a fab prize.I would share it with the family! I would indulge me and the family on boxing day with it as Im working Christmas day. I’d give to my parents to thank them for hosting Christmas this year…the brownie points might also get me out of the washing up! id give it to my mum. she has been doing her house up and has workmen in the house non stop. its not been very homely for her lately so this would be such a lovely gift for her. If I won the hamper I’d have to spend time finding room in the larder! I think I’d share it around – my mother-in-law loves Walkers biscuits and my my mum loves fruit cake. I think everyone would appreciate something from it! I’d give the chocolates, cake and Christmas pudding to my elderly neighbour, Dorothy, who has a very sweet tooth. She’s quite traditional, so I don’t think she’d appreciate the olives, cashews or chutney … but that’s fine, because I want to keep them for myself! I would also keep the port, because we have a longstanding ‘cheese & port on New Year’s Eve’ tradition in this house. My parents would probably get a few ‘bits & bobs’ too, because I would never hear the end of it if Dad didn’t get to sample the cookies and biscuits! We have lots of people over during the Christmas period, some like a tipple, some have a sweet tooth and others are savoury fanatics so it would all be devoured and enjoyed! I would share the hamper with my neighbours who are unemployed and struggling. Looks luscious! I’d probably share the hamper out with friends but I’d keep my favourite items! Great prize! I’d share it with my neighbours. I would visit some neighbours and invite them to spend a jolly evening with us in the build up to Christmas. There never seems time to stop and talk and this would be the perfect opportunity to initiate some community bonding! I would give to my mum for help with Christmas. I am going to see my family this christmas for the first time in years so I would love to give this to my parents to say thankyou for having me. I would take it to my mum’s for Christmas. I know she’s really looking forward to having me and my husband go to hers for the first time in a while, but she’s a little bit worried about providing enough food and drink, so it would be brilliant to be able to give this to her and for us all to enjoy it over the Christmas period. It looks amazing! Such a fab prize, I would keep some of it for me, hubby and the kids and take some to my Dads where we are going on Boxing Day to celebrate my little boys birthday!! I would have a unplanned pre-Christmas lets share the hamper bounty party, sit and chat and have fun until it has all been devoured. Lovely surprise for all. 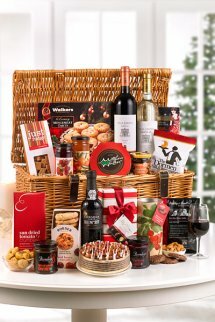 This hamper is wonderful, if I was lucky enough to win it I would share it with my family and have a Christmas Feast! I would give it to my nan for her and my cousin who are spending Christmas together as my grandad and aunt have passed away. Very nice. We’d enjoy working our way through that and I would love the hamper box for storage. I can’t resist the tin either. Hampers are by far my favourite presents at Christmas. This would be very nice! The Hamper would be used by everyone during their stay as it would pad out what I provide especially since it may not be enough, so it would save a lot of embarrassment. The wicker bit would remain as a lovely memento. Since most of the family are around mine this Christmas, it would be a welcome addition to help me cater. Lovely hamper great for everyone who is on a tight budget. I have 18 for Christmas lunch and supper on Christmas day so the hamper would be a wonderful treat for us all. What a fantastic prize would love to win this and would take it with me on Christmas night as I am nightshift and share it with my work collagues as a lovley treat. Charity starts at home so the first call would be family. I’d keep some for me and give some to other family members. I would make sure my family had a fab xmas and put the hamper to full use over the festive period! Lovely prize hun, I’d keep it for me, me, me! Well, I may share it with me mum lol. I would open it on Christmas day and share it with my hubby! I would give this to my parents, they work hard all tear running a animal sanctuary and dont even get christmas day off, they deserve a treat !! I’ve invited half a dozen who would be on their own to come to me for Christmas Day so this would be really useful. I would send it to my husbands gran because she is really lovely and would think this was fantastic. This hamper would be great. I would give it to the lady up the road whose husband is away this Christmas. After everything I have done and got for everyone this Christmas I would induldge and keep for my self – well, might share some bits with the girls on a pampered night in, or snuggled up with the man on evening! My son and his girlfriend are visiting this Christmas so I would give them the hamper as a special present to take home with them. If I was lucky enough to win this hamper, I would take it with my to parents house where I am going for xmas, and we could all share it out, my brother’s and their families and my parents and uncle. Great! Something for everyone. not sure mummy would even share with her little darlings! Wonderful prize. I would keep the hamper for our own family Christmas and have a really luxurious, indulgent festive season with all of the goodies in the hamper!